Late at night, Darling would often take a short taxi ride to the LIRR train station, avoiding the attention of neighbors she would receive if she walked. There she would take the train to Manhattan, frequently sitting across from Long Island starlet Joey Heatherton. Once there, she referred to her Cape Cod-style home, at 79 First Avenue in Massapequa Park, as her “country house” and hung out in Greenwich Village, meeting people through the circle of Seymour Levy, on Bleecker Street. Darling met Jeremiah Newton in the summer of 1966. Newton was on his first trip to the Village from his home in Flushing, Queens. The two would become friends and roommates, living together in Manhattan and Brooklyn until the time of Darling’s death in 1974. Her first assumed name was Hope Slattery. According to Bob Colacello, Darling adopted this name sometime in 1963/1964 after she started going to gay bars in Manhattan and making visits to a doctor on Fifth Avenue for hormone injections. Jackie Curtis stated that Darling adopted the name from a well-known Off-Off Broadway actress named Hope Stansbury, with whom she lived for a few months in an apartment behind the Caffe Cino so that she could study her. Holly Woodlawn remembers that Darling’s name evolved from Hope Dahl to Candy Dahl and then to Candy Cane. Jeremiah Newton believed she adopted her forename out of a love for sweets. In her autobiography, Woodlawn recalled that Darling had adopted the name because a friend of hers affectionately called her “darling” so often that it finally stuck. Before they met, in 1967, Darling saw Andy Warhol at the after-hours club called The Tenth of Always. Darling was with Jackie Curtis, who invited Warhol to a play that she had written and directed, called Glamour, Glory and Gold, starring Darling, as “Nona Noonan”, and a young Robert De Niro, who played six parts in the play. It was performed at Bastiano’s Cellar Studio on Waverly Place. Taylor Mead brought Warhol to see it and afterwards went to the club Salvation in Sheridan Square, where he was joined by Darling and Curtis at his table. Warhol cast Darling in a short comedic scene in Flesh (1968) with Jackie Curtis and Joe Dallesandro. After Flesh, Darling was cast in a central role in Women In Revolt (1971). She played a Long Island socialite, drawn into a woman’s liberation group called PIGS (Politically Involved Girls), by a character played by Curtis. Interrupted by cast disputes encouraged by Warhol, Women in Revolt took longer to film than its predecessor and went through several title changes before it was released. Darling wanted it called Blonde on a Bum Trip since she was the blonde, while Curtis and Woodlawn told her it was more like “Bum on a Blonde Trip”, titles which were both used in the film during Darling’s interview scene. For a short time, Darling worked as a barmaid at Slugger Ann’s, the bar owned by Jackie Curtis’s grandmother. 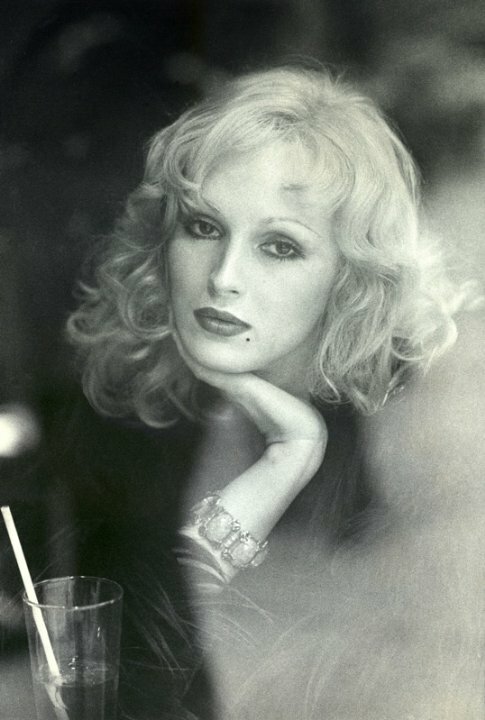 Candy Darling died of lymphoma on March 21, 1974, aged 29, at the Columbia University Medical Center division of the Cabrini Health Center. In a letter written on her deathbed and intended for Andy Warhol and his followers, Darling said, “Unfortunately before my death I had no desire left for life… I am just so bored by everything. You might say bored to death. Did you know I couldn’t last. I always knew it. I wish I could meet you all again.” Her funeral, held at the Frank E. Campbell Funeral Chapel, was attended by huge crowds. Julie Newmar read the eulogy. Darling’s brother Warren, not having seen her in years and unaware that she had been living as a woman, was said to have been visibly shaken by her feminine appearance. Darling’s birth name was never spoken by the minister or any of the eulogizers. A piano piece was played by Faith Dane. Gloria Swanson saluted Darling’s coffin. 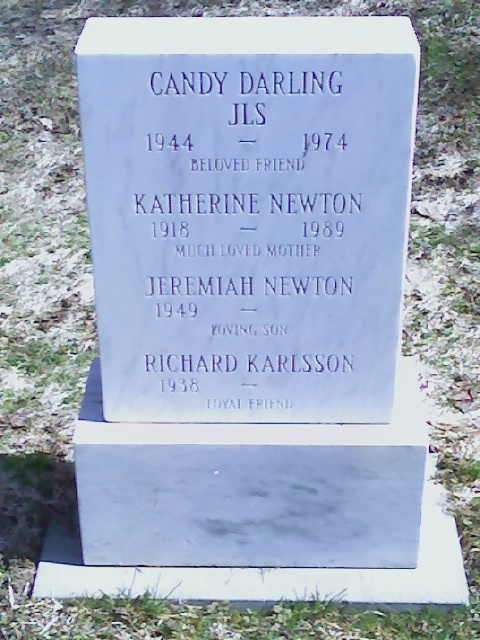 Candy Darling was cremated, her ashes interred by her friend Jeremiah Newton in the Cherry Valley Cemetery, located in Cherry Valley, New York, a tiny historical village located at the foot of the Catskill Mountains.